VR-32 32–Step Voltage Regulator 4-Step Auto-Booster ® Regulator Single-phase, electronically controlled voltage regulators accurately keep voltage levels within preset parameters for improved power quality. Cooper Power Systems offers distinct regulator types to suit the needs of particular applications. McGraw-Edison® voltage regulator controls from Cooper Power Systems are made with ease of use as a high priority. They feature built-in metering, voltage limiting, voltage reduction, reverse power flow operation, resident digital communications capability, time-tagged demand metering, profile recorder, tap position tracking, and source voltage calculation without an additional potential transformer. The Control Replacement Assembly (CRA) is designed to manage McGraw-Edison brand voltage regulators – and all domestically manufactured, single-phase, 32-step regulators, regardless of size or capacity. The CRA retrofits GE®, Siemens®, and Allis Chalmers® regulators – easily and reliably. Whether you use one of these brands or all of them, you’ll find the CRA is the most adaptable, functional and easy to maintain control available today. The CRA comes complete with the latest CL-series control and enclosure, a detailed installation and operations manual and a function code card. Our universal mounting bracket mounts easily to your existing regulator – with no holes to drill. All the hardware and brackets you need are included to make installation quick and easy. The CRA control box is available in two sizes: the Short Box and the Long Box. The Short Box has virtually every standard feature you will need for reliable operation – and room for one accessory. If your application requires two accessories, the Long Box provides the extra space you will need. Choose from a 2179 interface board, 2179 modem interface, DNP 3.0 Interface, SCADA relay or a heater. Accessories can be factory installed or retrofitted using the pro-tapped holes on the rear plate. The Cooper Power Systems’ Auto-Booster regulator is a single-phase autotransformer for voltage regulation without the high degree of sophistication of thirty-two step regulators. It provides four-step voltage boost or buck (depending on connection) with a 6% or 10% range. Each step represents 1-1/2% voltage change for 6% units and 2-1/2% change for 10% units. Auto-Boosters are equipped with a simplified control with fixed bandwidth and fixed time delay. These regulators are intended for use on laterals with a limited number of tap changes per day. The thirty-two step voltage regulator accurately regulates voltage in 5/8% steps from 10% raise to 10% lower on distribution circuits rated 2400 volts (60 kV BIL) through 34,500 volts (200 kV BIL) for either 50 or 60 hertz systems. 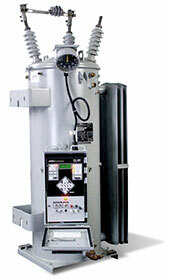 CL-5C Series Regulator Control features include built-in metering, voltage limiting, voltage reduction, reverse power flow detection and operation, resident digital communications capability, time-tagged demand metering, 30-hour profile recorder, tap position tracking, and source voltage calculation without an additional potential transformer.